Interesting and special ribbed fabric, with a shine as it was black lacquer, modern large cut with short sleeves and a big vertical zipper on the back. I really loved this basic, oversized Zara tunic dress. But, after my last wardrobe detox, it was stuck in the toss or recycle basket. The truth is, it was too hot to wear it in summer and too cold (short sleeves) to wear it in winter. At the end, I didn’t wore it at all. Recycling is my thing right now, my family can confirm, that I get sometimes too environmentalist and too ecologist about so many things that are not even possible here. Well, this little peace of shiny black fabric is not going to die and to pollute the Earth, yet. “I want to do something with it and wear it!” - I said to my mother, another recyclist (is it a word at all?) in our family. And she agreed and helped with advices. With Audrey Hepburn above my working desk I got the idea of creating my perfect little black dress. What did I do? 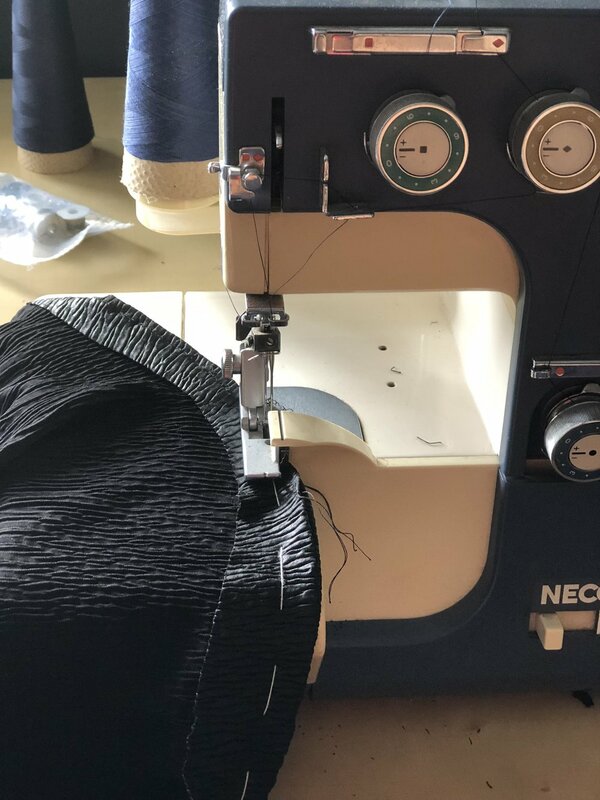 I’m not a professional seamstress but here are my explanations as an amateur and some photos of the process. The zipper was the first to go and it was boring but easy job to do. It’s made out of metal and cotton fabric and it totally didn’t match the light fabric of the tunic. It’s more of a jeans jacket zipper. Don’t worry, we’ll find his new purpose. Next were the sleeves I didn’t like so they had to go too. I just cut them off and decided to make gloves out of them. My mother started sewing them because she needed fitted, skin friendly fabric gloves to work in the garden, and the ones that are to find in the stores are not adaptable for her needs (read: very sensitive skin and skinny, long fingers). Now I use them too when helping with olives or figs picking. I'll try to find more extravagant purpose for these. The front décolletage was oval and I liked it so I left it as it is, but the back I decided to open a little to add some extra sexiness to leave everyone speechless when I exit the room. And of course, my fashionable cat would have enough freedom. I don’t say I don’t have the hourglass body shape and if I breath in strongly and never exhale I could maybe wear a very narrow, second skin dress and look like 90-60-90. But I don’t feel like myself in clothes where everything is shown and given on the silver platter. Some secrecy and elegance has to be there, don’t you agree?